Looking for a change of pace when knocking back drinks? Here are some interesting options to mix up your liquor cabinet. Like a noble phoenix rises from the ashes to live again, you too can rise from a hangover and imbibe. This 80-proof rum from Firebox is the perfect addition to any fiery cocktail. This Caribbean rum has a sweet and spicy flavor with a shimmery appearance. Unfortunately, just like Hogwarts, only citizens of the UK can partake. This 80-proof gin liqueur claims to be made with real unicorn tears that were harvested right from the animals' eyes (but not really; sorry fairytale villains). Each bottle is almost 17 ounces and contains a shimmery concoction that tastes like oranges, juniper berries, coriander, and liquorice. Sadly, if you want to taste unicorn tears, you'll have to take a trip to the UK. You can get whiskey that tastes like honey or cinnamon, but did you know you can get even wackier flavors? Booze lovers who also have a sweet tooth will be pleased to discover they can get their hands on some cookies and cream-flavored whiskey. Ole Smoky mixed 35-proof whiskey with cookies and cream liqueur to create a concoction that's delicious whether you're drinking it on the rocks or enjoying it on top of ice cream. Popcorn-flavored jelly beans are a source of contention for a lot of people, so this sesame and popcorn daiquiri—which you can pour directly into your glass, no mixing needed—is sure to be a controversial cocktail at any party. The nearly 17-ounce bottle is sealed with blue wax that smells like the salty booze inside. As long as you live in the UK, you can pick up a bottle to start arguments at your next shindig. Enjoy this street cart dessert in liquid form with the help of Smirnoff. The triple-distilled vodka has 30 percent ABV and works well in creamy, sweet cocktails. Yes, you're reading that right: pure milk vodka. Black Cow, a company in West Dorset, England, takes milk from grass-fed cows and turns it into booze. The company ferments the whey created by making cheese into a milk beer, which is then distilled, blended, and filtered. The resulting vodka—which is only available to UK residents—is sweet with hints of vanilla and cinnamon. This booze is the first and only vodka made with quinoa, according to FAIR, the company that makes it. It's the result of a partnership between French distillers and Andean farmers; the quinoa is grown in volcanic soils on the Altiplano plateau in the Andean mountains. The Beverage Tasting Institute rated the vodka superlative, saying it has "Very neutral aromas and flavors [that] suggest cream, cake, and minerals with a very soft, dryish light-to-medium body and a exquisitely smooth custard, dried fruit, and limestone accented finish. A superbly silky, elegant, and delicious vodka that is fantastic on its own and will be perfect in cocktails." As an added bonus, the booze is fair trade certified. Oddka is a vodka brand dedicated to weird flavors like fresh cut grass and apple pie—and they've also created "Electricity Vodka," an attempt to capture what a lightning bolt tastes like. The site promises a "shockingly good tongue-tickling shot"; one reviewer at Influenster described the booze as "a little sweet, a little fizzy," while a writer at Gizmodo UK said it tasted "like licking steel wool." Is there anything more Alaskan than salmon-flavored vodka? This booze is made with actual smoked salmon and distilled with glacier water. It can be enjoyed on the rocks or mixed into a Bloody Mary. Resist the urge to pour hot sauce right into your glass and buy this spicy vodka from UV. The hot, 60-proof alcohol is inspired by the cult favorite condiment Sriracha and even has a similar bottle design. Like the salmon vodka, this liquor is meant to go in a Bloody Mary; it can also be mixed with raspberry schnapps and cranberry juice. Chilled Dills pickle-flavored vodka is very high tech: The vodka is distilled six times before flavor infusion even begins—and the infusion process incorporates ultrasonic waves that, according to the website, "create chemical compounds that we can then filter out. The result is a cleaner, more pure spirit than can be created with traditional distilling practices." The booze is great for Bloody Marys, mojitos, and other brunchy cocktails. This sweet collection is composed of three cordials: blueberry pancake, maple bacon, and glazed donut. The maple bacon flavor apparently matches the taste of the meat pretty well, but the blueberry pancake (imitation) liqueur is, according to Serious Eats, "sweet to the point where I'm pretty sure I felt my pancreas shutting down." Red wood ants produce a compound called formic acid, a reactive compound in alcohol. 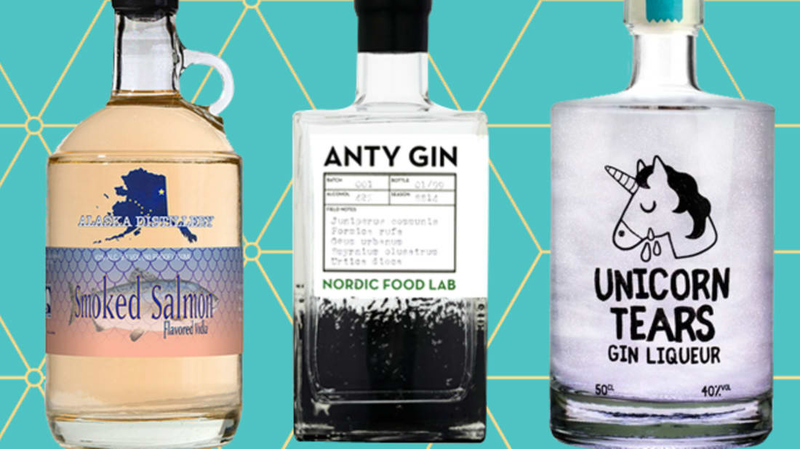 By making gin with these ants (each bottle contains the essence of around 62 ants), the Nordic Food Lab and the Cambridge Distillery were able to make a booze that has a distinct lemon lime flavor with a hint of lemongrass. Other notes include wood avens, nettles, alexander seeds, and juniper. The current batch is sold out, but keep your eye on their website to snag a bottle next time.